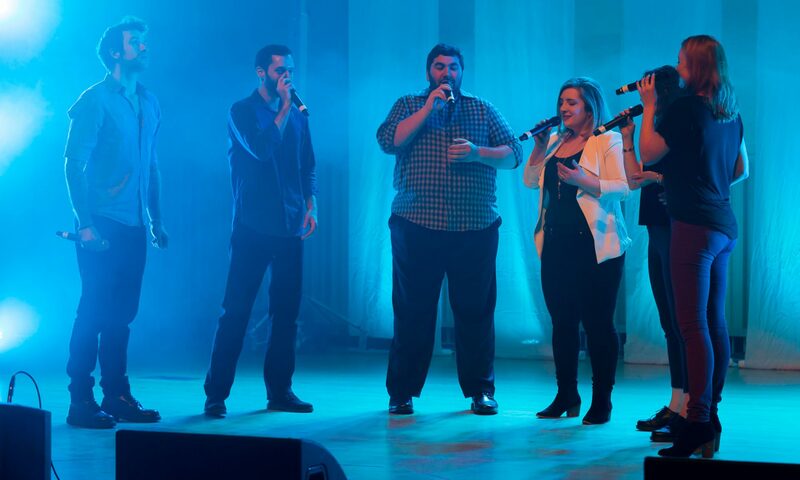 Concrete is an award-winning contemporary a cappella group based in New York City. With lyric melodies and a smooth blend, they use three-part harmonies and a low, rich sound to reimagine pop hits, classic rock and indie tunes for crowds at corporate events, outdoor festivals and weddings. They have performed in the US and internationally, including at SING! Toronto, Harmony Sweepstakes, the A Cappella Open and SingStrong. Concrete often uses their talent to help with marriage proposals — and have a 100% success rate! Melina is a soprano, real estate agent, and Brooklyn resident by way of MA, CT, and VT. She founded Concrete in 2015 with Caitlin, for which she has arranged and written original music. Classically trained, she cut her a cappella teeth with the Mount Holyoke College Diversions, and continued to sing with the NYC-based all female group, Empire. In addition to a cappella, she has sung with the Stonewall Chorale, performed at Carnegie Hall and BAM, and participated in various community theater productions including Puccini’s La Boheme and Rodgers and Hammerstein’s Cinderella (title role). When not performing or showing apartments, she can be found baking for Concrete members or attempting (and failing) to keep her Australian Shepherd from herding her two cats. Karaline is a current senior at The College of New Jersey where she is studying Business Management. She is the co-music director of The Trentones and has received “Outstanding Soloist” at her 2019 ICCA Quarterfinal. Karaline has performed at Lincoln Center, the Kimmel Center, the Rock and Roll Hall of Fame, and various other popular venues along the east coast. She is more than excited to be a part of Concrete! Caitlin is a New York City based actress, vocalist, events professional and cheese aficionado. Originally from Tallahassee, FL, she attended Florida State University, where she majored in Music and sang with All Night Yahtzee. Since graduating, she has served as music director of Boston’s The 508s, founder and music director of Seattle’s Shot in the Dark, and as music director of Empire A Cappella. She currently directs, arranges for and performs with Concrete, and is a member of the Founder’s Board for the Contemporary A Cappella League. Caitlin has won awards for her choreography and arranging, and her voice was featured on Voices Only 2009 as the soloist for All Night Yahtzee’s “Missing the War” by Ben Folds. Lior is a Transportation Engineer working on the redevelopment of JFK Airport. Originally from St. Louis, MO, Lior sang bass in The Shabbatones, the University of Pennsylvania’s premier Jewish a cappella group. In addition to Concrete, he is the bass for Six13 and also sings with Pella and Kol Haneshama. In his severely limited free time outside of singing, Lior does portrait and event photography for Lior Melnick Photography and can be found throwing Frisbee, traveling, playing softball, or taking candid photographs of his unappreciative friends. Aldon is a freelance musician originally from Columbus, Ohio. While in college at The University of Michigan, Aldon was the perc for Amazin’ Blue and won a handful of Outstanding Vocal Percussion awards along the way. While his focus is in Contemporary A Cappella, Aldon also arranges and performs Choral music, Sea Shanties, and Barbershop Harmony. Aldon got his start in Vocal Percussion imitating the sounds of a Guitar Hero controller, a game he still plays semi-professionally.